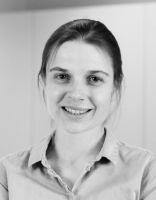 Andrea Ablasser studied Medicine at the University of Munich and received her MD in 2010. After a postdoctoral stay at the University of Bonn, GER, she joined EPFL in 2014 as tenure-track assistant professor. For her research accomplishments, she received the Swiss National Latsis Prize (2018), the ACTERIA Early Career Research Prize in Immunology (2018), the Eppendorf Award for Young European Investigators (2018), and the Paul Ehrlich und Ludwig Darmstaedter Prize for Young Researchers (2014).